With a mixture of dread and hope, “Another Earth” explores the old idea of a parallel universe, but does so in a fresh and intimate way that gives the question—and the film—far greater weight. Brit Marling, who also co-wrote the film with director Mike Cahill, stars as Rhoda, a pretty blond who’s just been accepted to MIT astrophysics program. Driving home drunk from a party one night, she hears a DJ announce that a planet exactly like our own has peeked out from behind the sun and is now visible in the night sky. What budding astrophysicist could resist such a sight? But Rhoda fails to pull over, instead poking her head out the window as she drives along, and plows headlong into a car carrying a family of three. Four years later, she emerges from prison and tracks down the only other survivor of the accident, composer/professor Jon Burroughs (William Mapother), whom she finds drowning himself in alcohol, depression and squalor. When she's confronted by this broken man, however, instead of confessing or apologizing, she claims to be from a cleaning service. And while Rhoda was serving her sentence, a Richard Branson-esque entrepreneur announced that he’s offering a free seat on his private spaceship heading for Earth 2 to whomever writes the best essay making their case. Marling and Mapother are great together, each of them slowly shedding the layers of detritus weighing on their souls, and the relationship that develops feels natural. We watch Rhoda evolve from a stupid kid into a woman, while John slowly emerges from the constant fog that’s dogged him since he emerged from his coma. Instead of pondering simply another you living a parallel life, or how different things could’ve been but for one bad decision, Cahill and Marling’s script ask you to consider what you would say if you had the opportunity to meet yourself. Sure, we all talk to ourselves every day—they acknowledge that much—but standing before yourself is an entirely different proposition. “Better luck next time!” Rhoda jokes when asked what she’d say to herself. Both the physical and metaphysical implications are cleverly underscored by narration from Dr. Richard E. Berendzen, a real-life professor at MIT. Cahill interviewed the esteemed professor—who once worked as Carl Sagan's teaching assistant—and chose snippets of the audio to weave into his story. Much of Cahill’s camera work is spot on, particularly in moments like the car crash and the first flickers of friendship between Rhoda and John are beautifully framed. And he expertly deploys his one special effect, the sight of Earth 2.0 looming in the sky, often feeling perilously close as it dwarfs the moon sitting over its right shoulder. It completely defies even a rudimentary understanding of astrophysics, but as a dramatic device it's stunning. 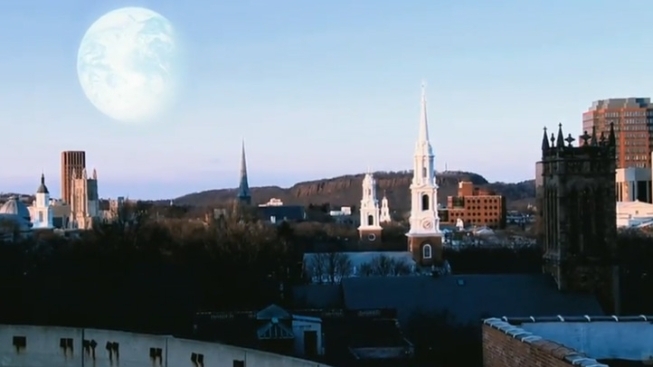 "Another Earth" manages to ask classic questions with a new twist, but does so without offering the answers, elevating it from simple genre fare to thoughtful introspection.